Four days of music from regional and international artists by the beach? Couldn’t ask for more. The regional gathering set up by Jordanian promoters NextUsJo is back to our little Sinai haven of Dahab for a second spell this year. Taking place between the 22nd and the 25th of August, the schedule doesn’t deviate much from last year’s, the only difference is that the lineup has nearly doubled in size and the artists on it now include some heavy international names, so naturally an extra day has been added. Much like last year, the opening party on the 22nd is taking place at downtown Dahab’s Totta from 10 PM - 3 AM. But this time it’s sponsored by Lebanese promoters Off & On and features an all Lebanese line up of Wael Ariss, L.Ø.C and MadJam himself who stole the show last year when he closed out the opening party with one of his signature high-intensity sets. Again the second day follows last year’s format where it’s split into two events: the first is a day/pool party with a lineup of Safe from Egypt and Jordanian DJs Avidbold and AYN, whereas the second half of the day will take place in Jabal Al Twailat mountain where the festival’s headliners all perform, marking the day as the festival’s main event. The lineup for the mountain gig includes acts returning to Chill O’posite for the second year, like Fulltone and Ouzo B2B Sebzz. 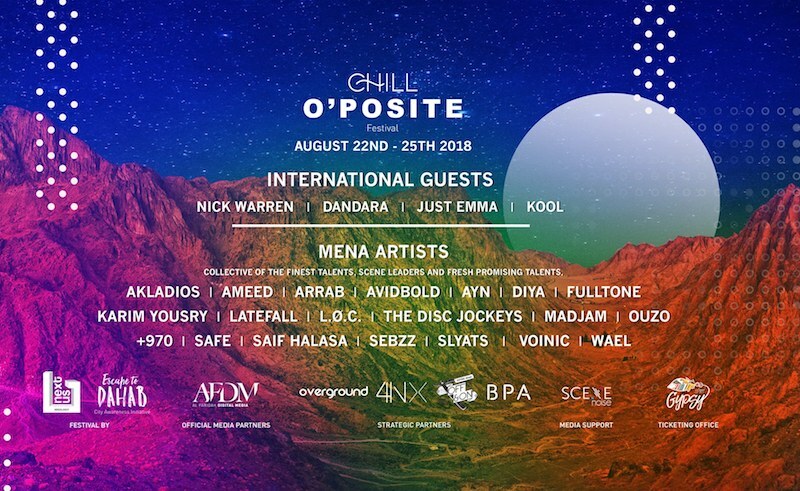 Making their Chill O’posite debut are the Jordanian DIYA along with veteran English DJ Nick Warren and famed German duo Just Emma. Day three will kick off with another pool party featuring an Egyptian roster of Arrab, The Disc Jockeys and Karim Yousry but will move to the rooftop of the Acacia Hotel at around 5 PM for a better view of the sunset and more diverse soundtrack by acts hailing from an array of countries like Latefall, Dandara, Saif Halasa and Voinic. Taking place simultaneously will be performances at Totta by Jordan’s Ameed, Avidbold in addition sets from our very own Akladios and Romanian minimal house DJ - Kool. The fourth and final day will be short and limited to chilling by the pool to the music of Palestine’s +970, Jordan’s Sou and Slayts, with Akladios playing her second set of the festival. We’re doing a very bad job at hiding our excitement for this year’s edition, given how much fun we had last year and how much potential we see for this festival. Book your place via Chill O’posite’s Facebook or through their official website.